One of the unfortunate aspects of a termite infestation is that it can go on for literally years before being detected. Unless you have your home inspected prior to listing it for sale or applying for a new mortgage, you may never notice their presence. A good sign that you have been infested is if you happen to notice winged termites flying in or near the home (where there’s one there’s bound to be a colony!) or perhaps you find signs of structural damage while performing routine household chores. In any event, there are a number of termite treatment options which you should consider prior to having your home treated. Not all companies will offer the full range of termite treatment options so it is a good idea to get several quotes before making up your mind. There are however a few things you can do in the interim to eliminate conditions which are conducive to termites. While you are taking care of these items you can research the various methods in which termites are treated which include wood treatments, chemical barrier treatments, termite baiting and Termidor. While deciding which type of termite treatment option is right for your particular termite problem it is important that you take the time to clear up all the areas that allow them to get into the structure of your home. Some of the things you might consider doing is fixing any leaky hose taps or downspouts. In fact, try to eliminate any source of excess water near or in the structure. Vents should be installed to provide adequate ventilation in crawl spaces and other such areas. Also, it is extremely important to eliminate and contact between wood and soil. Sometimes this means removing the wooden clapboard (the bottom run or perhaps two) that touches the ground/soil. In the past there were highly effective treatments for the elimination of termites but those chemicals are no longer used in the United States. As of 1988 the government banned their use which led to a widespread search for a chemical that would be as efficient but safer and within legal guidelines. The product that was banned was called Chlordane which was an organochlorine in the same family of chemicals as DDT. The procedure for treating with Chlordane was quite involved, time-consuming and costly. Albeit, it was perhaps one of the most effective products to ever be on the market and as a result many homes today which were treated 40 or 50 years ago still remain termite free. Unfortunately, it did pose very real health risks which precipitated it being banned. It seems that the more we progress technologically, the more we find that ‘old fashioned’ ways are best. Some of the most popular termite treatment options use old products in new ways. One such product that is growing in popularity is boric acid. It can be used to treat wood directly, has low toxicity to humans but is highly toxic to termites. It can be sprayed/spread directly on the wood and the residual effects are long lasting. However, this type of treatment necessitates access to all wooden beams or other wooden members which only works when the structure is under construction and it is quite time consuming. This is not a treatment of choice for an existing building with termite infestation. Chemical barrier termite treatment works in much the same way that the older, and now banned, Chlordane worked. A barrier must be established around and partially under the building through which termites won’t be able to pass. The key difference is that now newer chemicals are being utilized. This is perhaps one of the fastest treatments available as it only takes approximately 72 hours to be effective. However, there are some important disadvantages to chemical barrier termite treatment options. Primarily, many of these newer chemicals do not have the capacity to bond well with the soil and as a result the chemical will leach. Secondly, many of these newer chemicals do not bear up well with time and break down much too quickly to be long lasting treatments. Also, the barrier must be continuous which means that the flooring must be removed for an adequate job. Just as the name would imply, termite baiting is a method of treating termites by baiting them to various bait stations around the property. Contrary to what you might think, there is actually nothing to attract or lure the termites to these stations. There is simply a piece of wood buried which the termites will eventually find during their normal foraging activities. Periodic inspections will reveal the presence of termites in the wood, upon which time the wood is replaced by a cellulose matrix treated with termiticide. The termites carry this oral termiticide back to the colony which kills other termites through normal interaction with each other. When the colonies die and no further infestation is detected, the cellulose matrix is replaced by wood and monitoring the bait station commences again. The chief disadvantage here is that it is an extremely slow process that demands continuous monitoring. Also, it does not prevent future infestations and the process would be a never ending cycle. 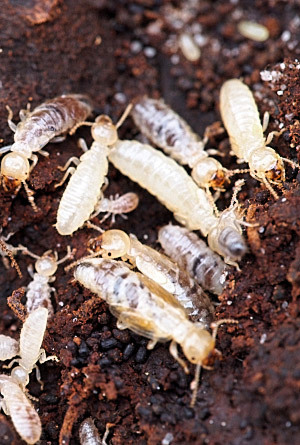 In the termite industry, Termidor has gained quickly in popularity because it captures the best of both types of treatments, repellants and termiticides. Its application is similar in nature to barrier treatments but rather than being a mere repellant that termites detect, it is an actual termiticide that they will never get a whiff of. They will then freely forage through the treated area, bring the termiticide back to the colony and within a relatively short time the colony is killed off. The beauty of Termidor is that it requires a very low solution by as little as .06% and has proven to be effective 100% of the time. It works much more quickly than baiting systems and will actually continue to provide protection over a long period of time. Because this particular termiticide requires such a low solution it is considered to be the most environmentally friendly. Now that you have an idea of the various termite treatment options it is time to actively seek a termite treatment company that offers the particular service you are looking for. Remember, you have plenty of time to seek a solution as those termites didn’t just happen to appear one day doing all that damage. Termites build colonies over a long period of time and their work is slow, albeit, destructive. Because of this, you really do have time to carefully consider and weigh your options so that you know you have chosen the treatment that you are comfortable with. Since there are newer termite treatment options on the market that are relatively environmentally friendly, you may want to run with those. However, in the end the choice is yours so find a company that has the product and services you require.